All children attending Southey Green Primary School & Nurseries are expected to wear school uniform. All items are available to order from the school office. In summer girls may wear navy or pale blue checked dresses and boys can wear grey or black shorts. Sports wear and denim is not permitted as part of school dress. For safety reasons shoe heels must be no higher than 1 1/2 inches. 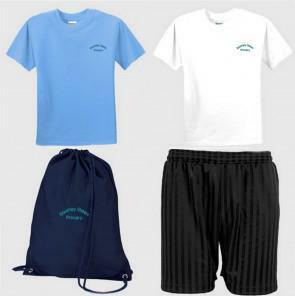 Change of Clothing – For all PE and games lessons, it is a requirement for all children to be provided with a change of clothing – just normal kit of black shorts and white T-shirt (and pumps or trainers for sessions outdoors).